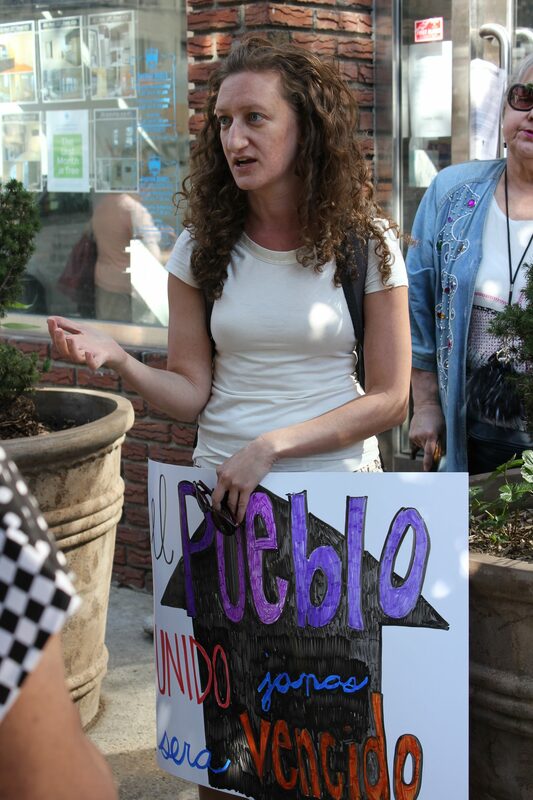 Two different local protest actions once again highlighted the harassment tactics that are displacing low-income tenants in neighborhoods across the city last week. 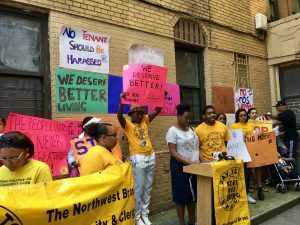 It has been over a month since tenants from the Tenant Association of 124 E 176th Street sent a letter to their landlord, David David, who was on the Public Advocates “Worst Landlords” list twice under different aliases. He owns dozens of buildings in the Bronx, and his priority is unquestioningly profit over all else, including the lives of people who have the misfortune to live in his buildings. Senator Gustavo Rivera stood in solidarity with tenants to call for an end to these predatory practices. In their letter, tenants asked David to meet with them to discuss the primary concerns of residents, including harassment, lack of repairs, and serious health concerns caused by mold, infestations of mice and rats, and lack of security. They received no response. One tenant, Corine Ombongo-Golden, has taken to referring to her landlord as “Dracula” because of the draining affect his actions have had on her and her neighbors. She described how he constantly takes tenants to court saying that they owe money when they are actually up to date. 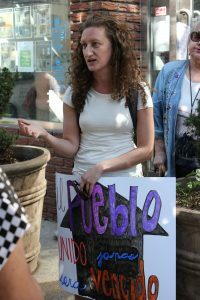 “He is a master of strategic harassment,” she said, adding that, in addition to these frivolous court cases, tenants suffer through “verbal and other forms of harassment, like not making repairs and racist rhetoric.” With support from the Northwest Bronx Community & Clergy Coalition, tenants came together to protest these unjust actions at a rally outside of their building on June 28th. Click here to see New 12’s coverage of the event as well as Telemundo 47. The same afternoon, tenants of Meyer Orbach’s CoSo Apartments, working with the Goddard Riverside Law Project held a rally and demonstration to protest increasing tenant harassment. 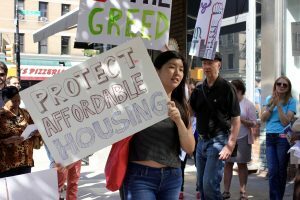 The Orbach Group, which owns over 70 apartment buildings within the Manhattan Valley area is currently under investigation from the NYC Attorney General’s office for a pattern of abuses towards rent stabilized and rent controlled tenants throughout their portfolio. 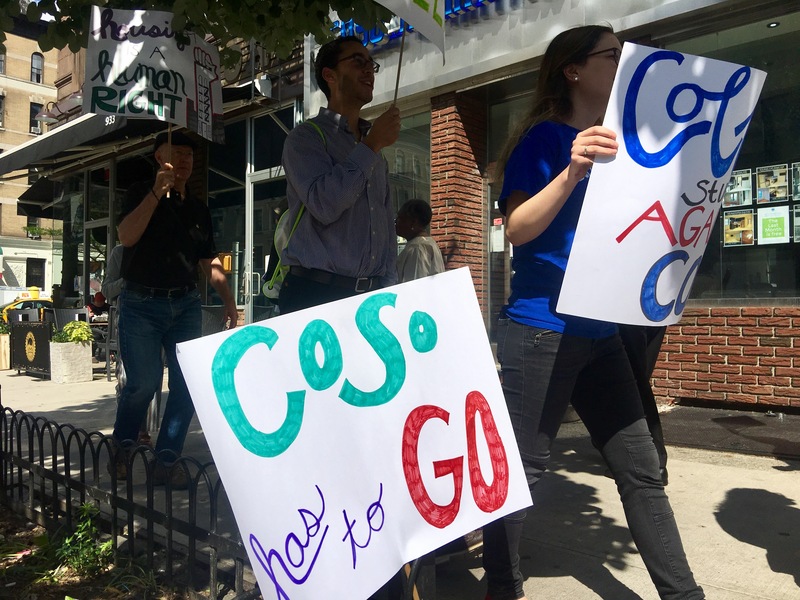 Council Member Helen Rosenthal and members of New York State Senator Marisol Alcantara’s office, Council Member Mark Levine’s office, and Manhattan Borough President Gale Brewer’s office were there to show their support. Both actions were affiliated with the Coalition Against Tenant Harassment, which includes community groups from around the city organizing for increased protections for rent-regulated tenants. Egregious behavior by landlords continues to pop up in building after building, neighborhood after neighborhood, all over the city. The tools currently in place clearly don’t do enough to prevent landlords motivated by future profits from resorting to illegal tactics to drive out tenants. But knowing that harassing tenants might put a permanent dent in those future profits could provide a real disincentive for those same landlords. 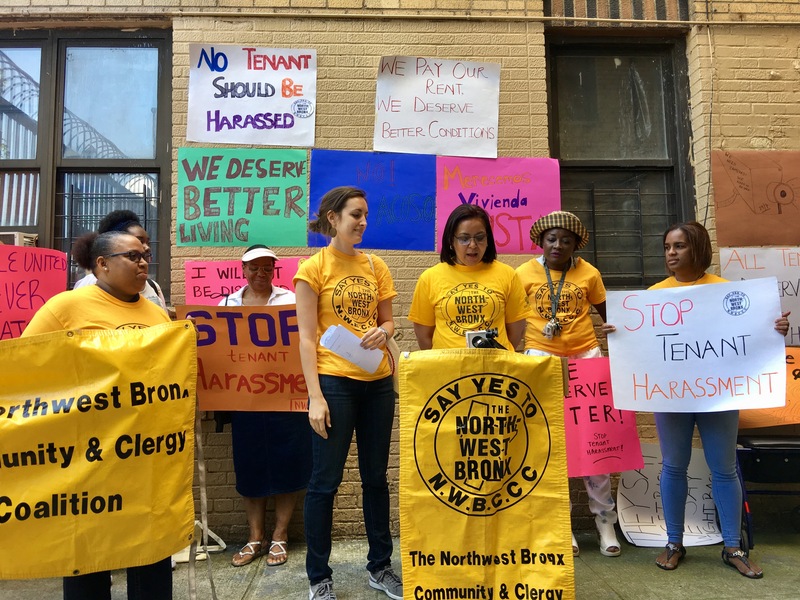 A strong citywide Certificate of No Harassment (CONH) law would be enough to make landlords think twice about using harassment to drive out tenants. To learn more about the legislation and the Coalition Against Tenant Harassment (CATH), visit our website.